Can people who got famous because of their own over-the-top personalities be good actors? Maybe, but none of them are in this film. Which is not to say this isn’t a thoroughly entertaining movie. Just that if you’re expecting fictional characters…you won’t find them here. Let’s talk about Camp Takota. 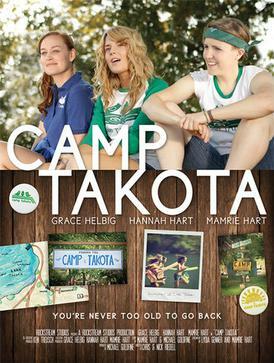 The premise: Produced, written and starred in by Grace Helbig, Mamrie Hart, and Hannah Hart of YouTube fame, Camp Takota is basically like a high schooler’s first attempt at filmmaking, only with a fancier camera. It follows Elise, a wannabe writer who loses her publishing job and her fiance on the same day, and runs away to her old summer camp to find herself. This set-up takes more than twenty minutes to resolve, which is ENTIRELY TOO LONG. The rest of the film is just camp shenanigans and the girls failing to supervise children because they’re too busy drinking, with a bunch of poorly threaded together side plots. And then they have to save the camp, of course. Why you should watch it: Here’s the thing about this film. The story is clunky, the acting is painful, and the pacing is absolutely bonkers. One minute you’re watching a way-too-long exposition dump conversation, the next you’ve just watched six plot points whizz past your head at top speed in a single sentence. And yet, despite the awkward plotting and poor cutting, this film manages to be entertaining–a fact credited almost entirely to the same charisma that made Helbig and the Harts famous in the first place. Their acting is wooden and their dialogue stilted, but you kind of don’t care, because it’s still Grace and Hannah, and they’re funny. And they’re playing themselves. Hannah is literally a cook in it. But if Hannah Hart has taught us anything, it’s that everything is funnier with alcohol. This movie proves the rule. The drinking game: Drink for puns, and every time someone drinks. Bonus: Take a shot every time we get a gross-out joke, because we need to celebrate a movie that isn’t afraid to admit girls are gross.